Hayes Pump distributes Fybroc® broad line of fiberglass reinforced pumps. These pumps are available in different materials to provide excellent corrosion resistance for tough applications including pumping of acids, brines, caustics, bleaches, solvents, seawater and a wide range of waste liquids. Hayes Pump is a factory-trained, stocking distributor for Fybroc and provides local support and inventory. 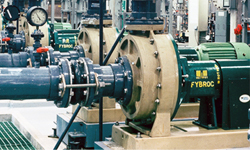 Fybroc developed the first fiberglass reinforced pump in 1966 and has continued to focus on non-metallic pumps for more than 30 years. A Resin Transfer Molding (RTM) process is used to produce the fiberglass components in Fybroc pumps and optimizes both corrosion resistance and strength. RTM reinforces high stress areas with precision appointment of long strand fiberglass, providing physical properties that allow thinner walled structures and permits the use of nearly pure resin systems for optimum corrosion resistance. This process optimizes both corrosion resistance and strength, while the compression molding approach lacks. Fybroc is a brand of Met-Pro Global Pump Solutions, owned by CECO Environmental. Hayes Pump offers Fybroc in Maine, Massachusetts, Vermont, New Hampshire, Rhode Island, Connecticut, New Jersey, Greater New York City Metro and Eastern New York State. The corrosion resistant Series 1500 horizontal pumps built to ASME/ANSI B73.1 standards are available in nineteen sizes. Capacities to 5000 GPM, working temperatures to 250°F for VR-1 and 275°F for EY-2. Working pressure to 200 PSI and heavy duty shaft. ISO/DIN/JIS flange configurations available. The corrosion resistant Series 1530 pumps provide the space and weight savings of a close coupled pump combined with the ruggedness of a standard Series 1500 pump. Sixteen sizes are available. Capacities to 1500 GPM, working temperatures to 250°F for VR-1 and 275°F for EY-2. Working pressure to 200 PSI and integral shaft sleeve. ISO/DIN/JIS flange configurations available. The corrosion resistant Series 2858 pumps feature ISO standard dimensions. These pumps are available in five sizes. Capacities to 325 GPM, working temperatures to 250°F for VR-1, working pressure to 200 PSI and heavy duty shaft. FRP baseplates available. The Series 3000 pump features a recessed impeller design. These corrosion resistant pumps provide smooth flow-through pumping for heavy duty application and are available in five sizes. Capacities to 1200 GPM, Working temperatures to 212°F, working pressures to 175 PSI, back pull-out design and FRP baseplates available. Series 2530 Fluid end built to ASME/ANSI b73.1 standards. Ten sizes available. Capacities to 1,500 GPM, working temperatures to 180°F for VR-1, 275°F for EY-2, working pressures to 200 PSI. FRP baseplates and ISO/DIN/JIS flange configuration available. Self-Priming Series 2630 combine same features with volute casing to provide short and efficient priming times. Two sizes are available. Capacities to 320 GPM, working temperatures to 180°F for VR-1, 275°F for EY-2, working pressures to 145 PSI. FRP baseplates and ISO/DIN/JIS flange configuration available. These pumps combine efficiency with excellent priming times. The Series 1630 offers space and weight savings of a close-coupled pump. Series 1600 and Series 1630 each have six sizes available. Capacities to 1400 GPM, working temperatures to 250°F for VR-1, 275°F for EY-2, working pressures to 175 PSI. FRP baseplates and ISO/DIN/JIS flange configuration available. Series 1600 self-primers combine efficiency with excellent priming times and feature substantial parts interchangeability with Series 1500 pumps. Six sizes are available. Capacities to 1400 GPM, working temperatures to 250°F for VR-1, 275°F for EY-2, working pressures to 175 PSI. FRP baseplates and ISO/DIN/JIS flange configuration available. Series 1630 offers the benefits of a close coupled pump integrated with the features of the Series 1600 pump. Six sizes are available. Capacities to 1400 GPM, working temperatures to 250°F for VR-1, 275°F for EY-2, working pressures to 175 PSI. FRP baseplates and ISO/DIN/JIS flange configuration available. The corrosion resistant Series 5530 pump is designed for the most difficult dry pit application. It offers space and weight savings combined with the ruggedness of a standard Series 5500 pump. Sixteen sizes are available. Capacities to 1400 GPM, working temperatures to 250°F for VR-1, 275°F for EY-2, working pressures to 175 PSI. FRP wrapped shafts and settings available to 36 inches.